Pie Face, the 24-hour Australian pie shop, opens its fifth Manhattan location at 464 Ninth Avenue (and West 36th Street) on Monday, August 5th. 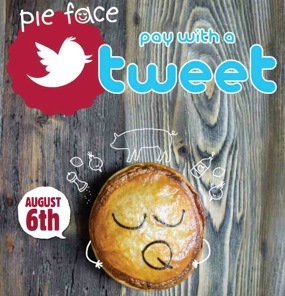 To celebrate, Pie Face is launching “Pay With a Tweet” at their five locations, starting this Tuesday. “Pay With A Tweet” will kickoff the first Tuesday of every month with a new, featured pie. This month’s “Pay With a Tweet” pie is the summer favorite BBQ Pork, with a flaky, buttery crust, light puff pastry top and tender pork BBQ filling. Like all their pies, the BBQ Pork is handmade with 100% real butter crust, topped with an adorable face to indicate it from the many different selections. By simply tagging Pie Face on Twitter or Facebook in a shop and showing it to a pie dealer during “Pay With A Tweet” Tuesdays between noon and midnight, New York City pie lovers will receive a FREE seasonal pie, flavor changing monthly. In addition to the monthly special, the Pie Face menu features classic, sweet favorites like the Mini Apple Pie, Chocolate Pie and Cherry Pie along with their savory offerings. Lunch specialities extend from pies, to rolls, sandwiches and wraps like the Sausage Roll, Chipotle Chicken Sandwich and the Tuna Salad Wrap. To complement their sweet and savory gourmet menu, Pie Face’s signature coffee program has something for everyone, with espresso blends like the soft, “Open My Eyes!” to the hard blend “Start My Heart!” and the stronger “Kick My Arse!” blend. This entry was posted by Rosemarie on Monday, August 5th, 2013 at 5:39 pm	and is filed under American/Comfort, Bakery, Manhattan, Midtown West. You can follow any responses to this entry through the RSS 2.0 feed. You can leave a response, or trackback from your own site.